Studies of furnishings and plate from the Church of St. Mary, Liege, Tongres. 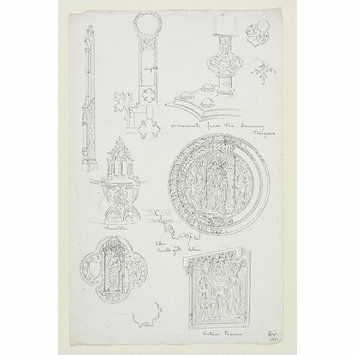 Studies and details of ecclesiastical plate, including two morses, one circular and one quatrefoil, a framed painting, part of a thurible, the base of a reliquary, the side of a reliquary or monstrance, and the upright arm of a crystal cross, with some sections of mouldings given. The circular morse is very rich, with several mouldings on the rim. 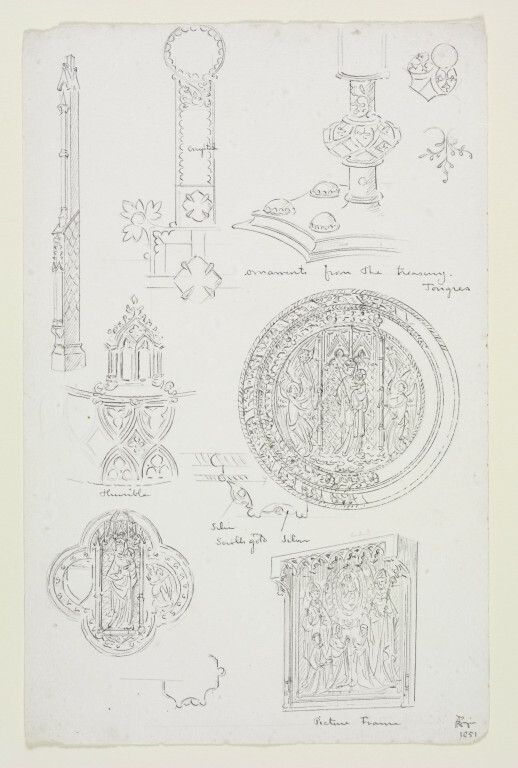 A. W. Pugin. One of 135 assorted topographical drawings. Alexandra Wedgwood, A.W.N. Pugin and the Pugin Family , London; V&A, 1985, p. 282.